Yakama Nation cultural leader Russell Jim talks about the Hanford Nuclear Reservation in south-central Washington and the social, cultural, economic, and political issues that surround it. The talk was delivered at the University of Washington Husky Union Building in Seattle, WA, on February 23, 2001. 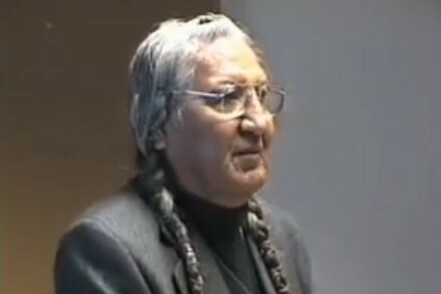 A board member of the Center for World Indigenous Studies (CWIS) and Director of the Nuclear Waste and Restoration Management programme for the Yakama Nation, Russell Jim has spent more than 20 years raising the Yakama Nation’s voice and demanding the US government clean up the Hanford Nuclear Reservation (HNR), one of the most contaminated places on Earth. Built in the Yakama Nation’s “front yard,” HNR was the world’s first full-scale plutonium production reactor. It manufactured the plutonium used in thousands of nuclear bombs; including the very first one ever detonated on July 16, 1945, and in “Fat Man“, the bomb detonated over Nagasaki, Japan on August 9, 1945. During its years of operation (1943 to 1987) HNR also produced millions of gallons of highly radioactive waste, all of which is now stored on site in 177 underground tanks. Roughly 67 of these tanks have leaked more than a million gallons of waste into the local soil. HNR further released more than 200 different radionuclides into the air and local waters. While most of the releases are considered to be accidental or a “natural” part of operations, on December 2-3, 1949, the U.S. Air Force intentionally released between 7,000 and 12,000 curies of iodine-131 into the air as part of a secret experiment known as project “Green Run”. As Russell Jim reveals, there also appears to have been a “human radiation experiment on the Yakama Nation” involving the radioactive isotope “phosphorus-32”. “But there is a consistent denial by federal agencies and by science” he continues, “that there is no proven effects of radioactivity”. The isotope itself, is often used today in scientific research and medical treatment. Nevertheless, Jim expresses concern about the possible impacts on the Yakama in the next couple generations. Perhaps one day, he fears, Women will no longer be able to give birth. According to the International Agency for Research on Cancer (IARC), phosphorus-32 is a known cause of cancer in humans and animals when it is taken internally. Further, says the IARC, “exposure of animals to phosphorus-32 in utero led to prenatal death, reduced growth, malformations and gonadal and pituitary lesions.” It was also shown to produce “chromosomal aberrations” in humans. Hanford Downwinders were kept in the dark!